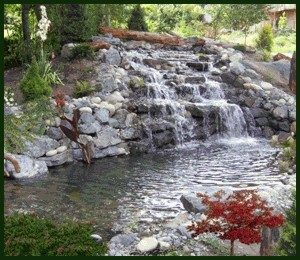 Properly installed water gardens offer daily enjoyment and relaxation, more than you might imagine. You will be fascinated with brilliantly colored fish and stunning self-watering plants. They are a self supporting, naturally maintained ecosystem that allow you to have time for the things you enjoy most! Reconnect with Nature… Enjoy the soothing sound of a waterfall or babbling brook right in your own back yard!